Writing Obituaries A Timeless Art. Is the obituary page the best read page in the newspaper? 2 Is the obituary page the best read page in the newspaper? 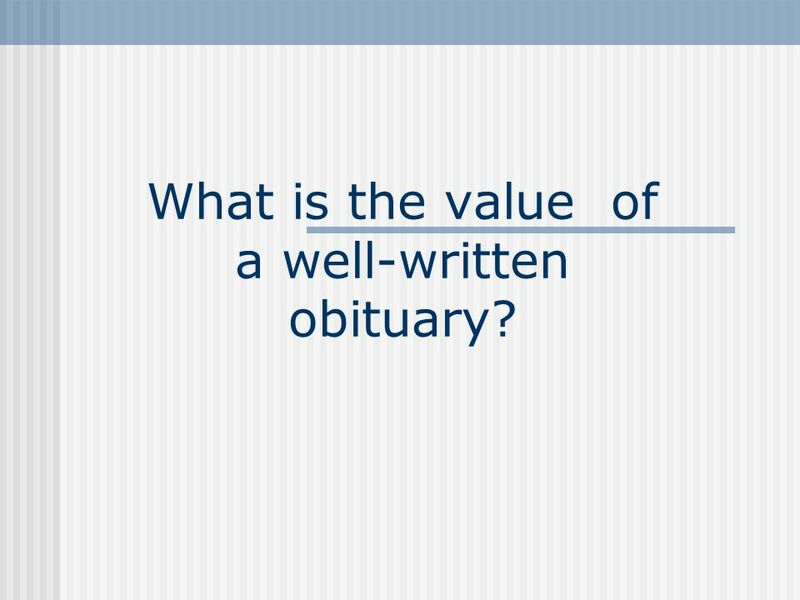 3 What is the value of a well-written obituary? 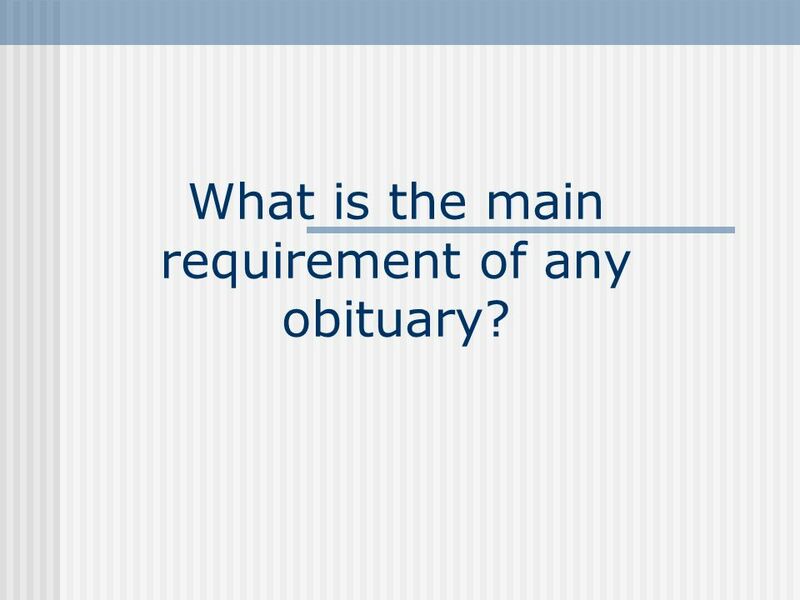 4 What is the main requirement of any obituary? 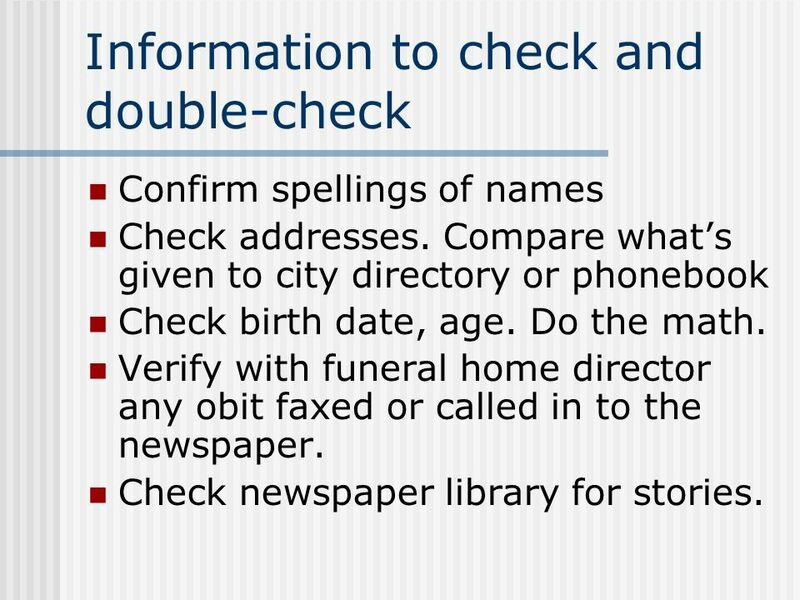 9 Information to check and double-check Confirm spellings of names Check addresses. 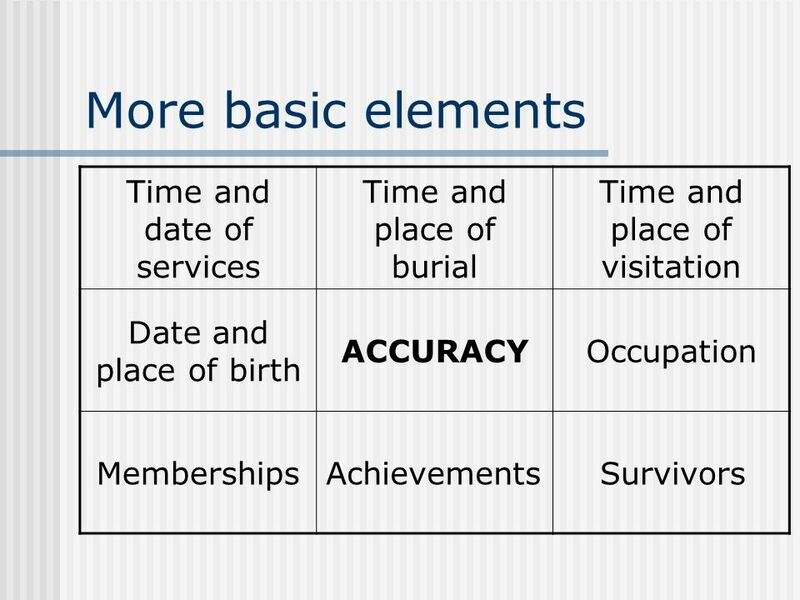 Compare whats given to city directory or phonebook Check birth date, age. Do the math. 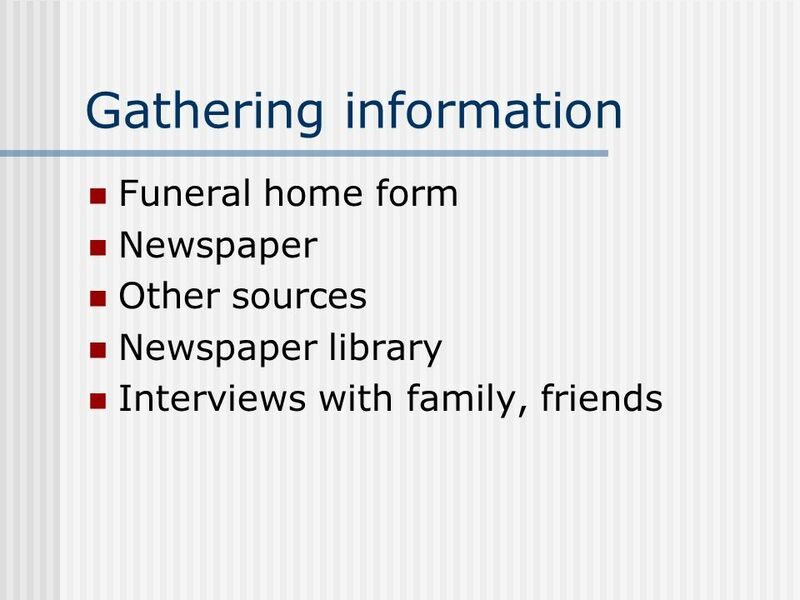 Verify with funeral home director any obit faxed or called in to the newspaper. Check newspaper library for stories. 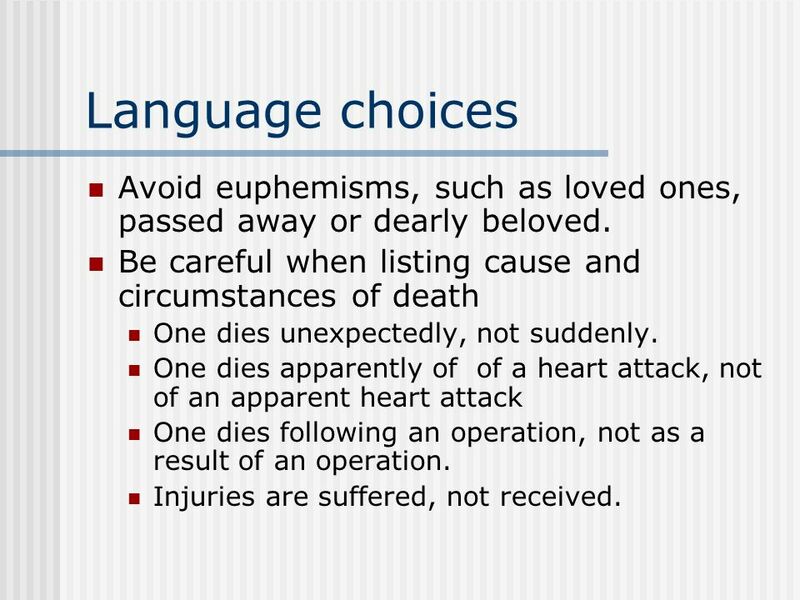 10 Language choices Avoid euphemisms, such as loved ones, passed away or dearly beloved. 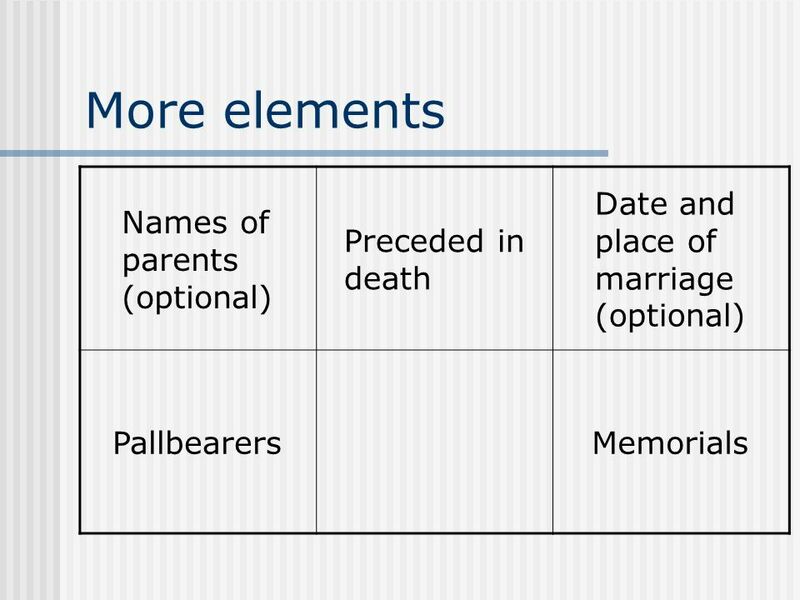 Be careful when listing cause and circumstances of death One dies unexpectedly, not suddenly. One dies apparently of of a heart attack, not of an apparent heart attack One dies following an operation, not as a result of an operation. Injuries are suffered, not received. 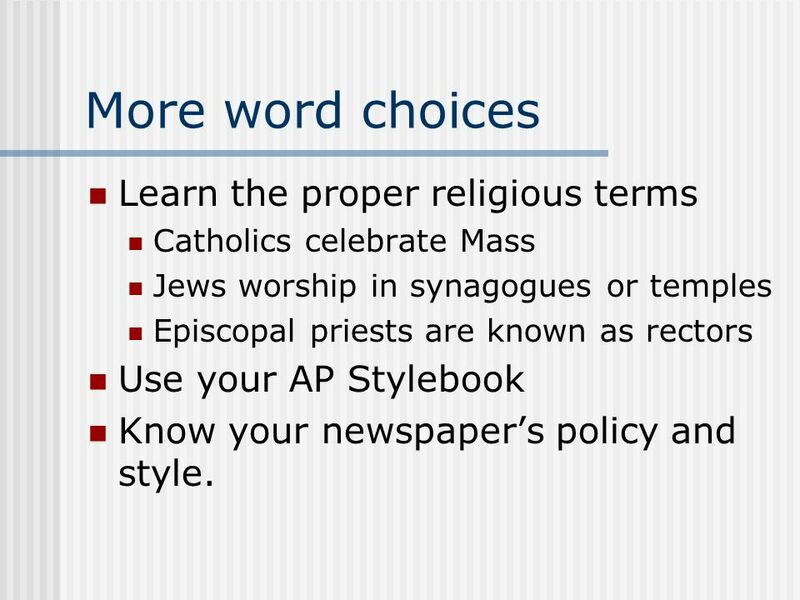 11 More word choices Learn the proper religious terms Catholics celebrate Mass Jews worship in synagogues or temples Episcopal priests are known as rectors Use your AP Stylebook Know your newspapers policy and style. 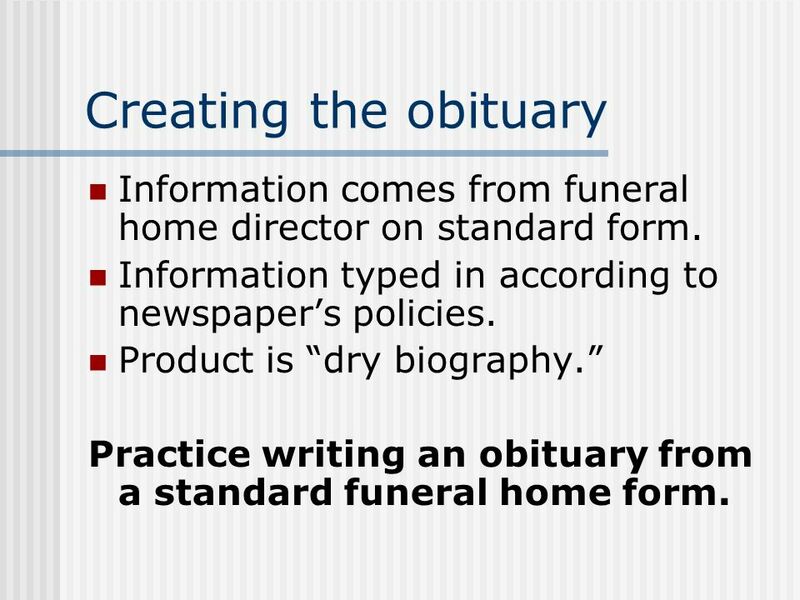 15 Creating the obituary Information comes from funeral home director on standard form. 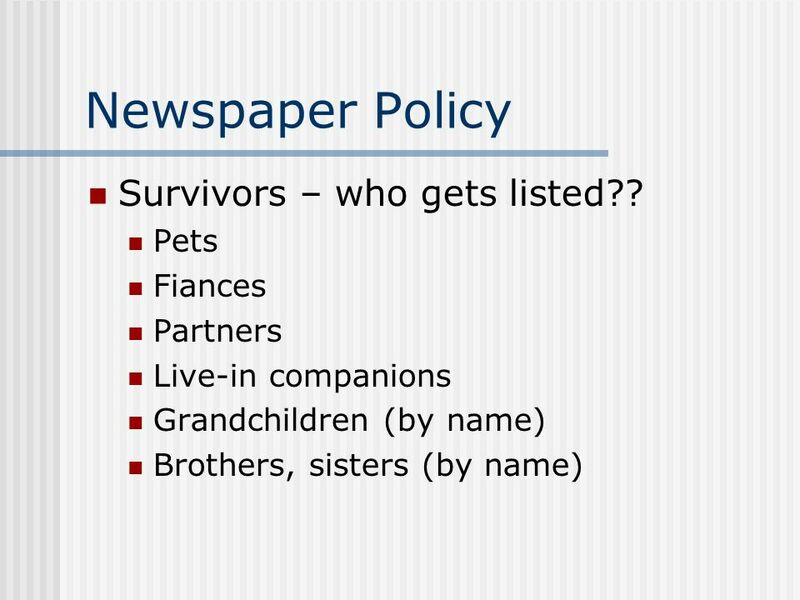 Information typed in according to newspapers policies. Product is dry biography. 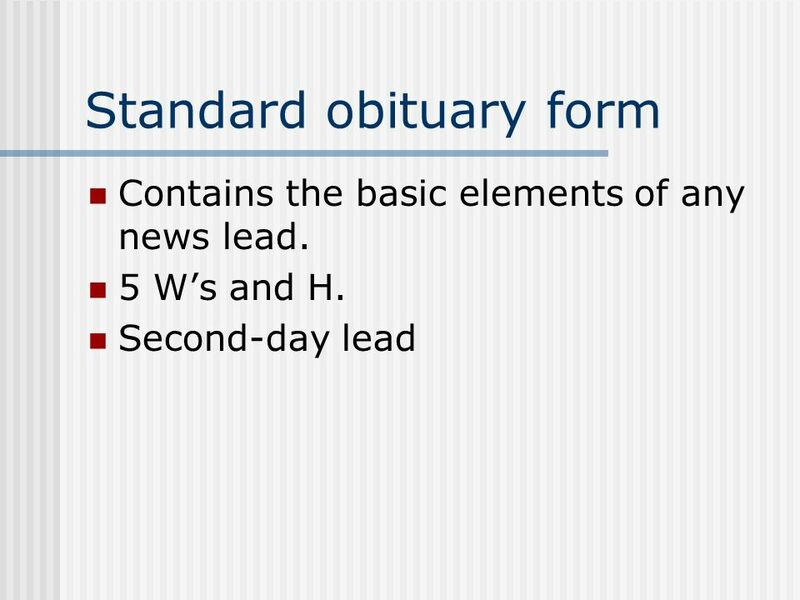 Practice writing an obituary from a standard funeral home form. 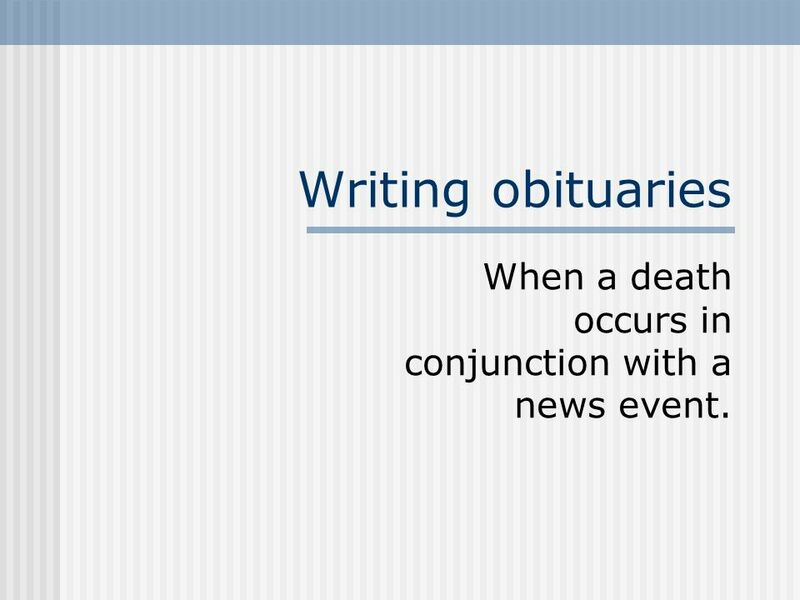 16 Writing obituaries When a death occurs in conjunction with a news event. 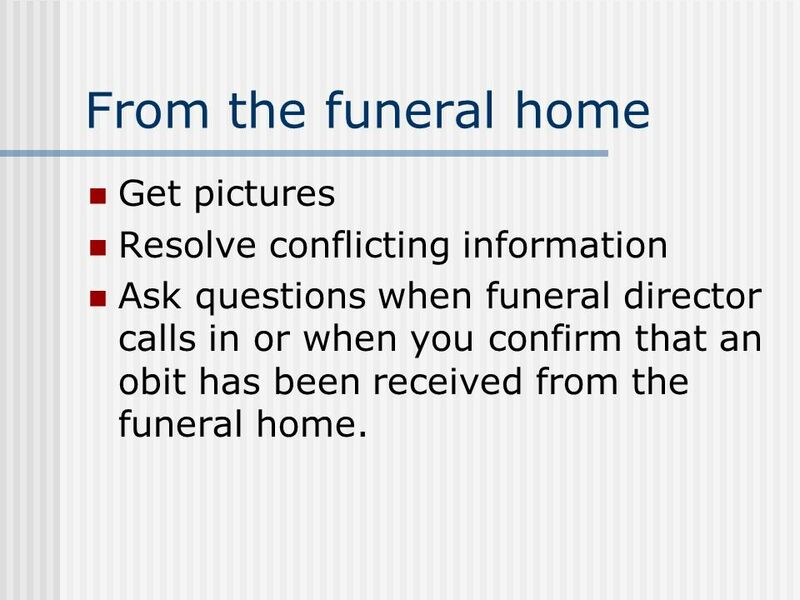 18 From the funeral home Get pictures Resolve conflicting information Ask questions when funeral director calls in or when you confirm that an obit has been received from the funeral home. 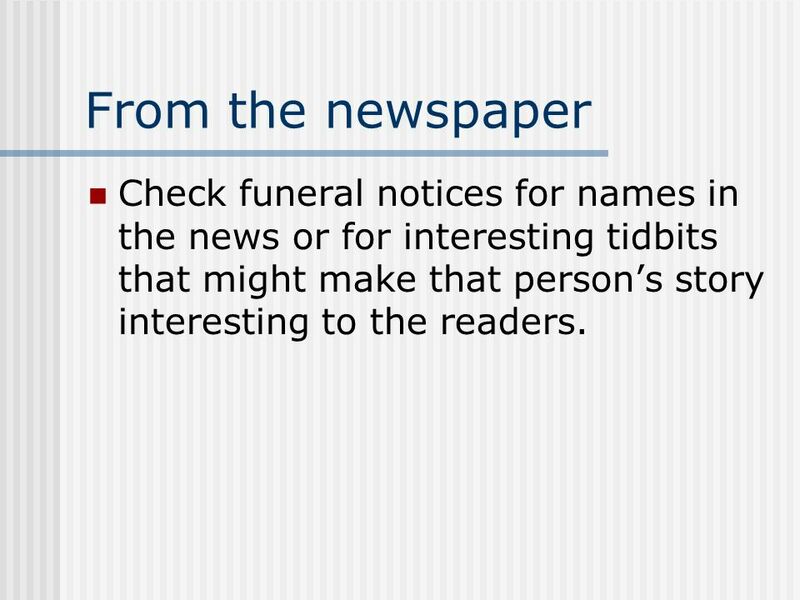 19 From the newspaper Check funeral notices for names in the news or for interesting tidbits that might make that persons story interesting to the readers. 20 From the newspaper library Check past clips that include the deceased. 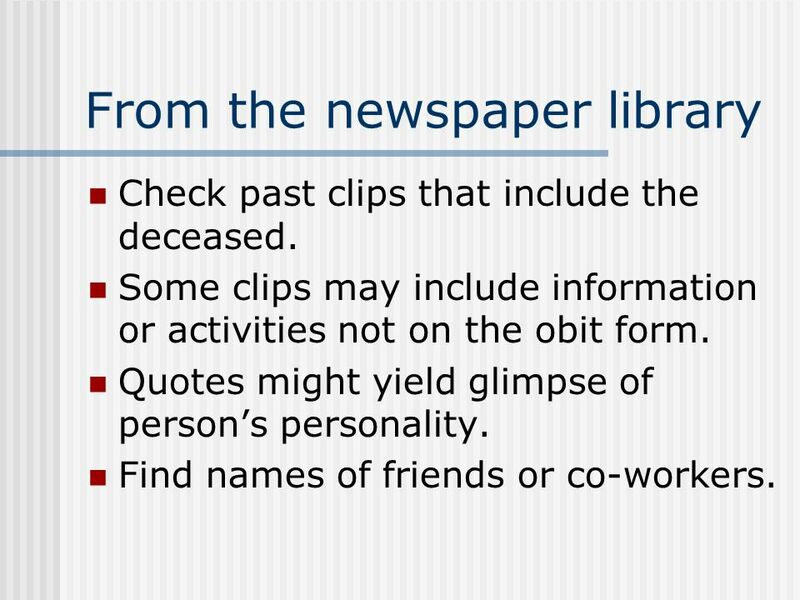 Some clips may include information or activities not on the obit form. Quotes might yield glimpse of persons personality. Find names of friends or co-workers. 21 From family, friends Dont be afraid to make the call. Many times family members welcome talking about a loved one. Dont ask, How do you feel? 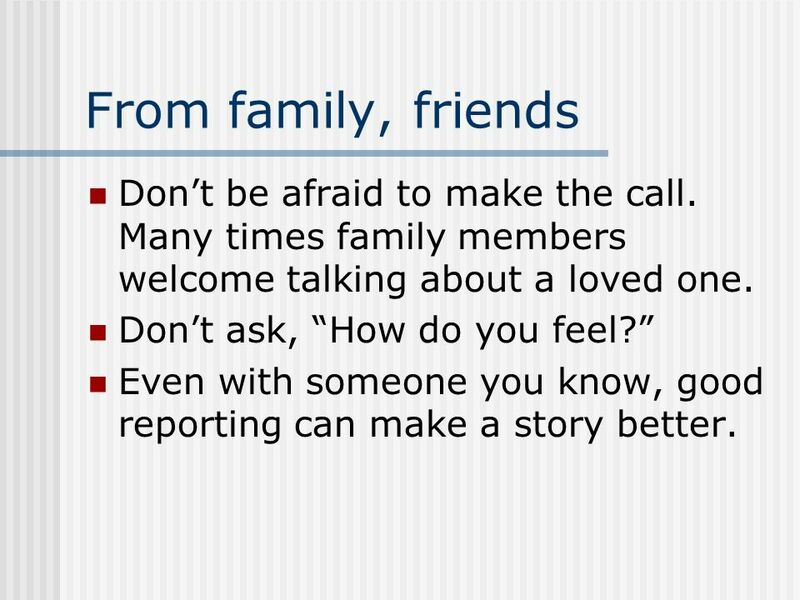 Even with someone you know, good reporting can make a story better. 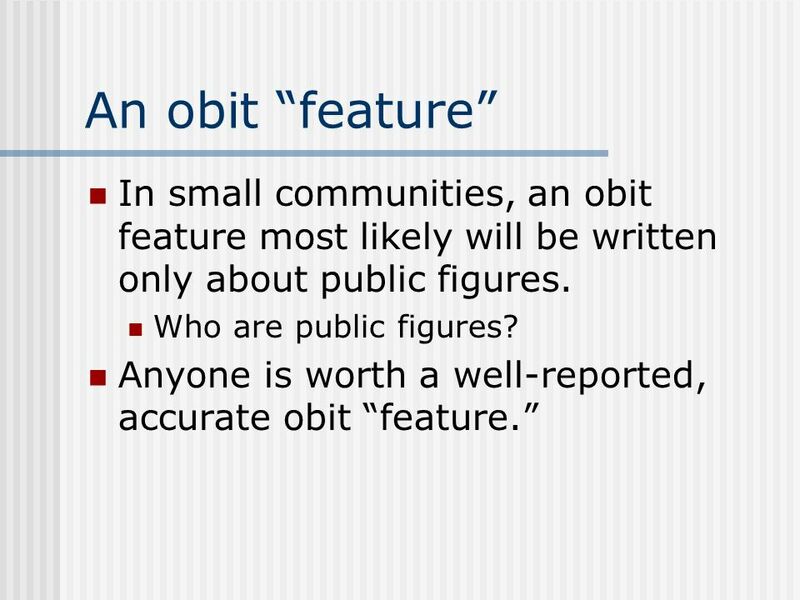 23 An obit feature In small communities, an obit feature most likely will be written only about public figures. Who are public figures? 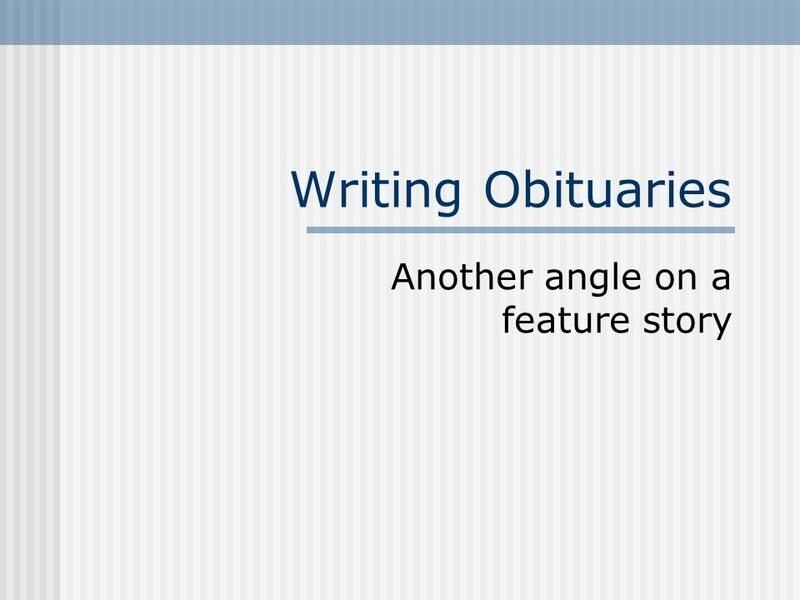 Anyone is worth a well-reported, accurate obit feature. 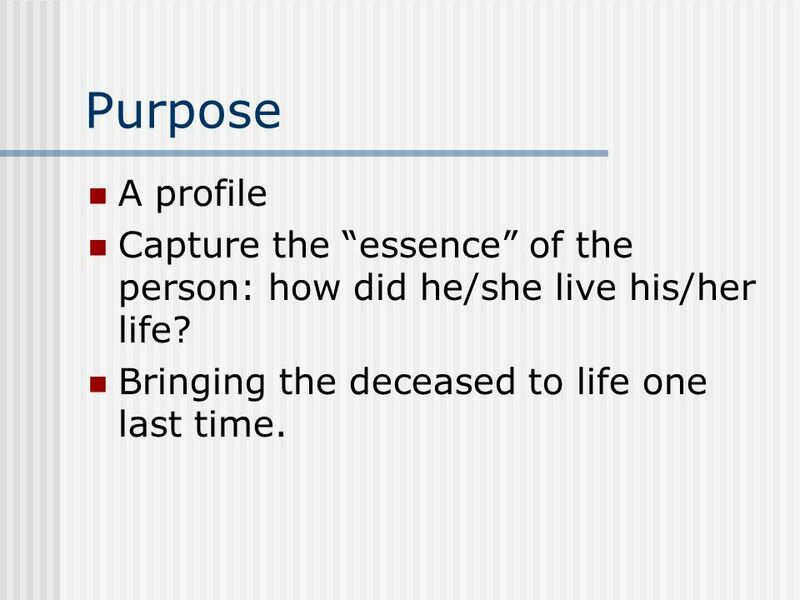 24 Purpose A profile Capture the essence of the person: how did he/she live his/her life? Bringing the deceased to life one last time. 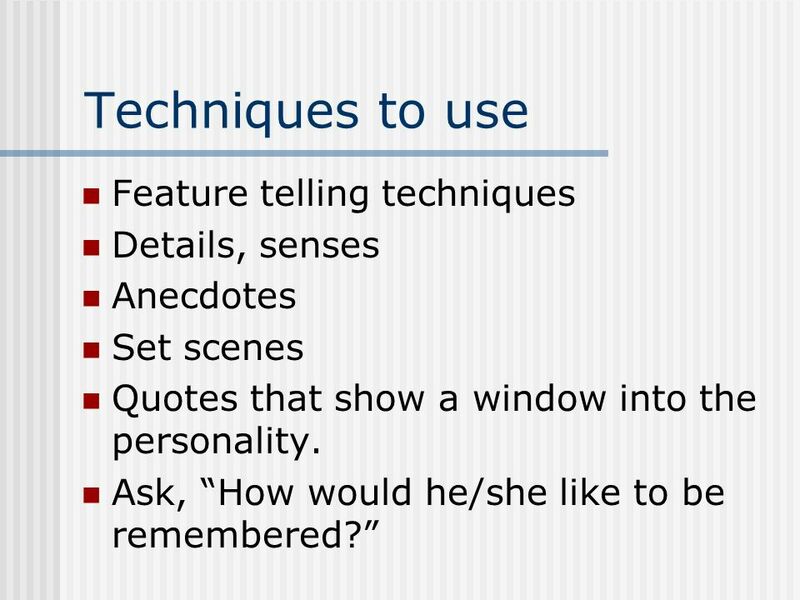 25 Techniques to use Feature telling techniques Details, senses Anecdotes Set scenes Quotes that show a window into the personality. Ask, How would he/she like to be remembered? 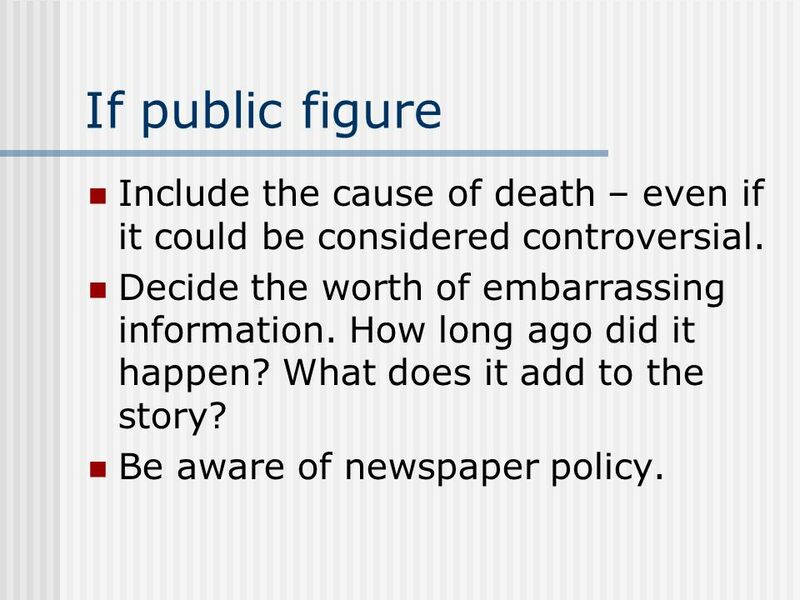 26 If public figure Include the cause of death – even if it could be considered controversial. Decide the worth of embarrassing information. How long ago did it happen? What does it add to the story? 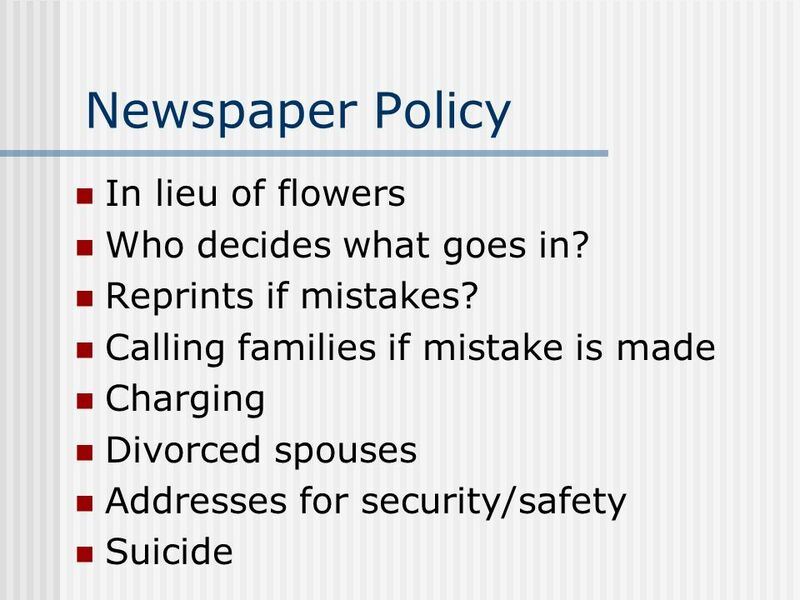 Be aware of newspaper policy. 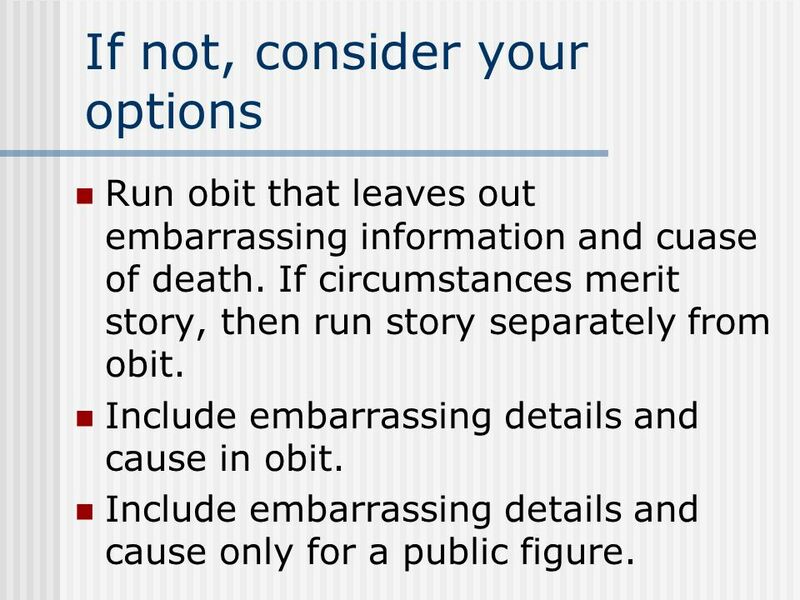 27 If not, consider your options Run obit that leaves out embarrassing information and cuase of death. If circumstances merit story, then run story separately from obit. 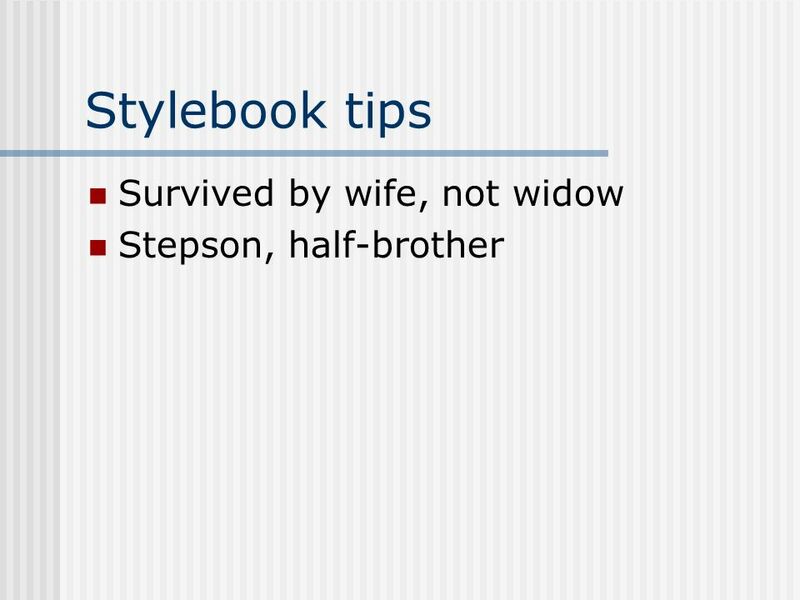 Include embarrassing details and cause in obit. Include embarrassing details and cause only for a public figure. 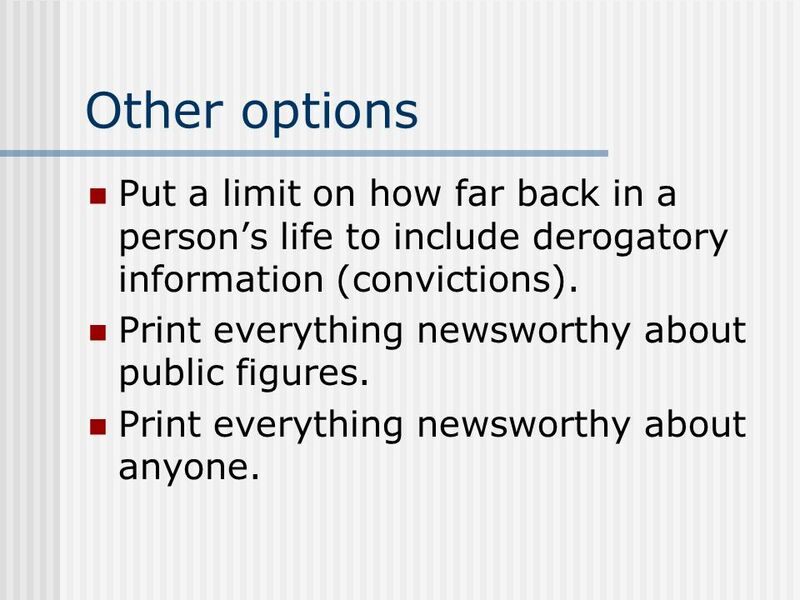 28 Other options Put a limit on how far back in a persons life to include derogatory information (convictions). Print everything newsworthy about public figures. Print everything newsworthy about anyone. 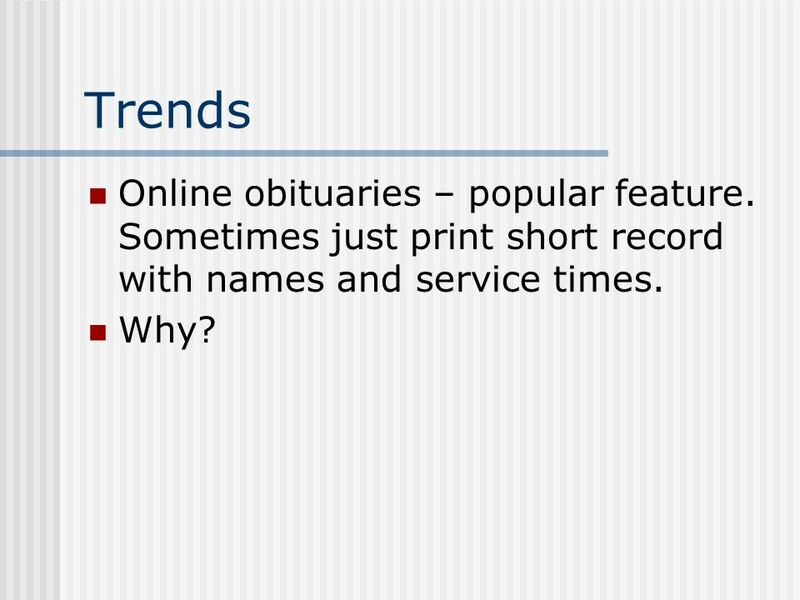 29 Trends Online obituaries – popular feature. Sometimes just print short record with names and service times. Why? 30 Final check Correct? Complete? Check sources? Style? Policy? 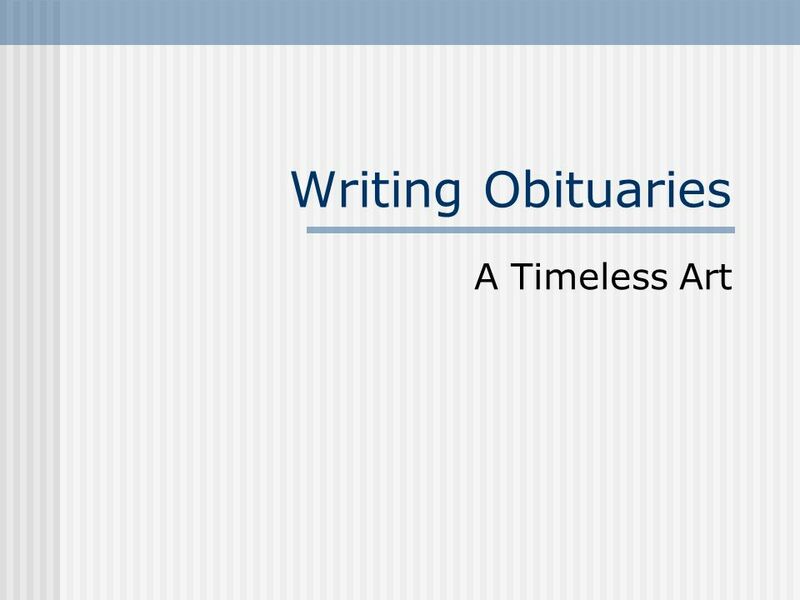 Download ppt "Writing Obituaries A Timeless Art. 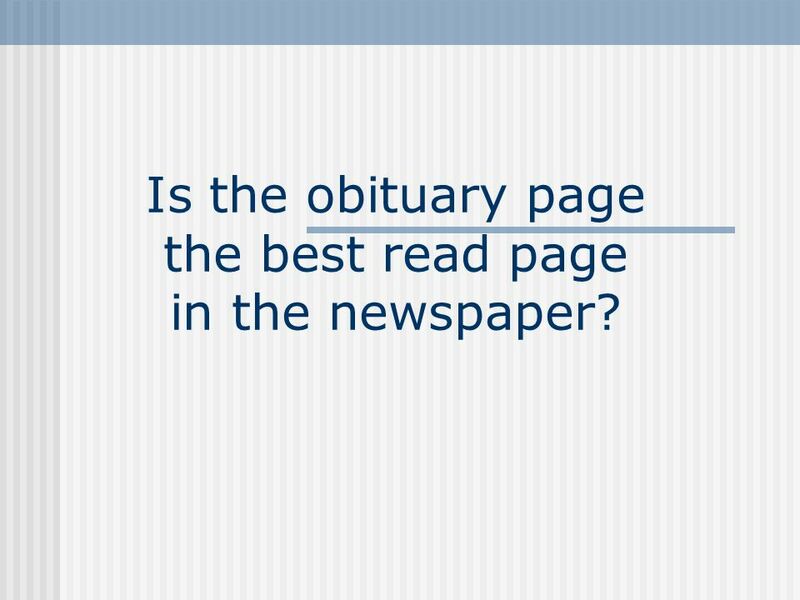 Is the obituary page the best read page in the newspaper?" Week 11: Journalism 2001 April 10, Review of last week’s news Hard News: Hard News: –Major local stories –Major national stories –Major international. Decision Making Making responsible decisions will help you deal with conflict and peer pressure while managing stress. Mrs. Day - 9th Lit/Comp. Nonfiction Essential Questions Why should you believe me? 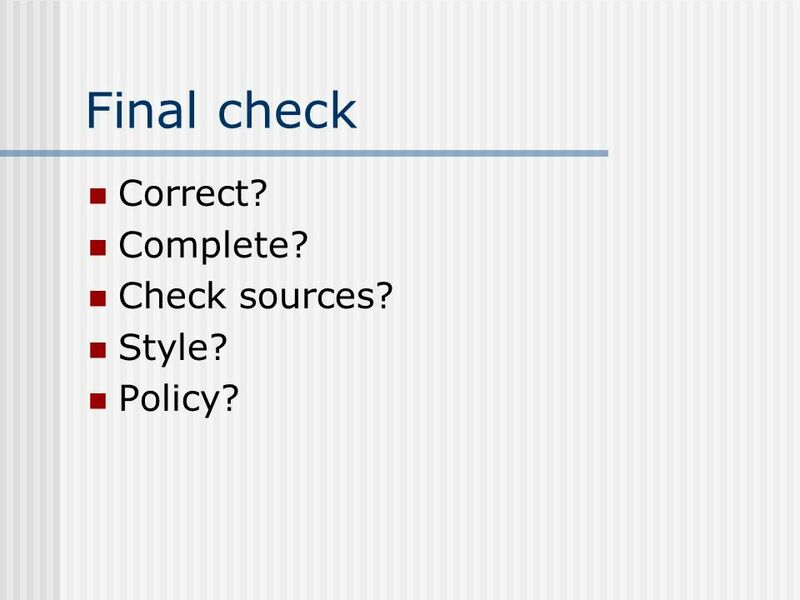 What makes a credible source? What makes a good leader? How can I persuade. PRESENTATION BY: JENNA LORD AND TUGCE CEYLAN STORY OF AN HOUR BY: KATE CHOPIN. CHIPPER FUNERALS A Friend of the Family since 1889 The Role of the Funeral Director Presented by Simon Hughes. The Woman Warrior Understanding the mother/daughter relationship. Launching the Writing Workshop Ms. Burns Day 1-10. Fire, Crime, Accident reporting. Preparation Sometimes you can check your newspaper library. At other times, breaking news is occurring and you must gather. Updated March  Writer  Blogger  Videographer  Radio & TV Commentator  Webmaster. LESSON 17 CONNECTIONS 1.James is the president of a charity that has been asked to help a foreign country that hates the U.S. but is experiencing a severe. Public affairs and the media Part 1: Crime, law enforcement, courts, obituaries. Biography Writing a Biography. Write a Biography Meaning of biography Bio graphy Bio means. 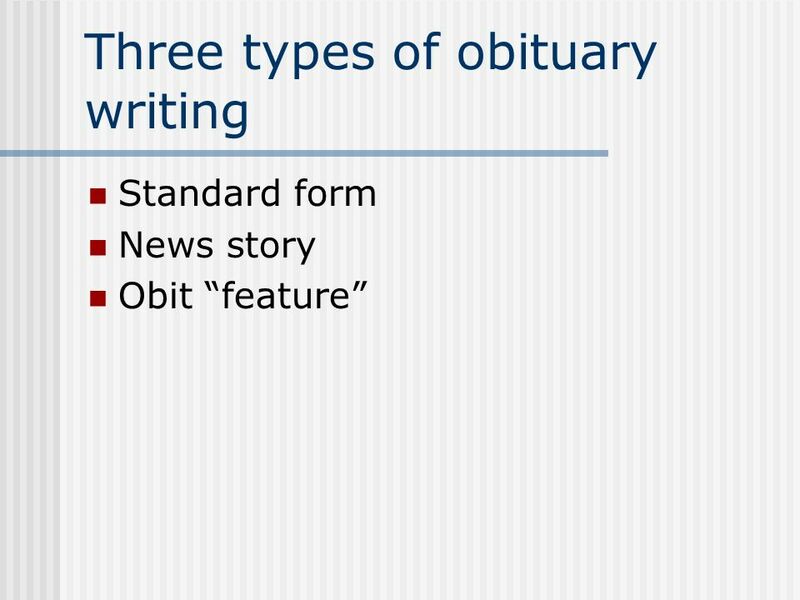 Writing news Learning objective: to understand the structure of a news story remembering the three Cs – clear, concise, correct. Obituaries Adapted by Dr. Mike Downing from News Reporting and Writing, Eighth Edition.